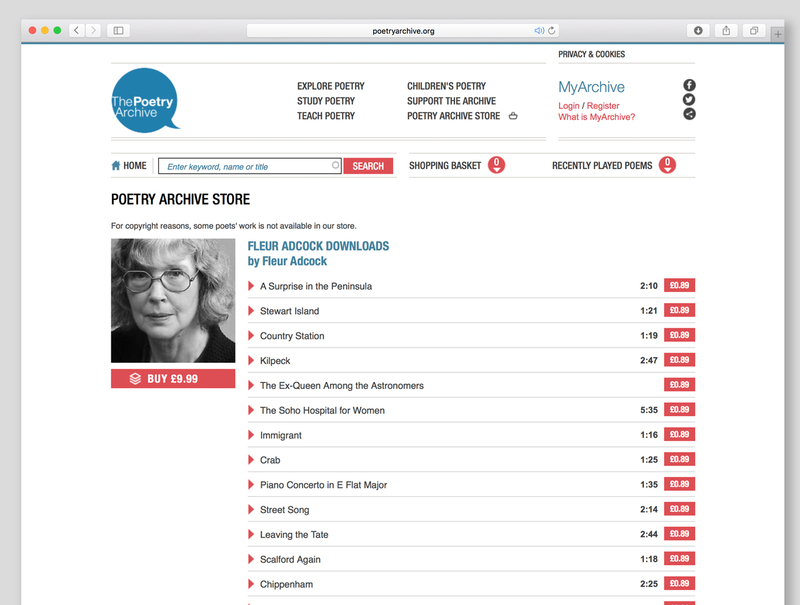 The Poetry Archive is a unique online collection of poets reading their own work - with original recordings dating back as far as Tennyson and Sassoon - and more contemporary recordings read by poets and celebrities such as James Earl Jones and Judy Dench. With over 250,000 visitors to the site each month, when the Archive launched their download store (supplied by a third party company) in 2012 they felt sure that they would be able to become more self-sufficient as a charity; to continue to grow their collection of recordings and poets and conserve voices that might otherwise be lost. Unfortunately hefty monthly costs plus 20% commission on any sales imposed by the third party meant their store soon became a crippling catch-22. Clunky navigation and a difficult user interface meant that the sales funnel was almost non-existent, with customers dropping out before the checkout. And the third party workflow meant the Archive were waiting for months on end before uploads were populated into the store. An experience that should be enlightening and exploratory was frustrating, time consuming, and ultimately cost the Archive revenue. We worked with the Archive to create a simple new download store for their Drupal-powered site, improving the customer journey, navigation and overall store interface to drive sales. We also consolidated and significantly sped up their upload process so tracks could be added to the store in seconds, not months. The Archive no longer pays commission on their earnings and their monthly expenditure has been significantly reduced. The improvements to the user interface and sales funnel speak for themselves, increasing their revenue by 700% in the first 3 months.